The typical tenure of a CEO in a family business is close to 20 years, more than double that of a non-family business. And while many family business CEOs love what they do, have a deep sense of stewardship and are eager to train their successors, there are others who feel trapped. For them, it’s a life sentence without parole. Sometimes we discover that a leader’s problem in handing off the baton to the next generation is symptomatic of a deeper problem – as was the case with the Vlansk family. Bruno Vlansk started the Vlansk Restaurant Supply Company thirty-five years ago and has been running it ever since. Bruno is Type-A, highly driven, a control freak, and everything is done his way or no way at all. 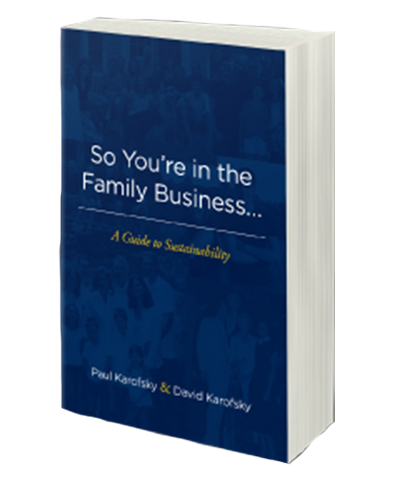 He brought his two sons into the business over the last 15 years, and we were brought in to create a leadership transition plan to pass the business down to his sons. But the sons don’t see eye to eye on how the business should be run. One of them spends most of his time running the company, while the other is not as committed as he needs to be to the business, for which there is neither accountability nor consequences. There’s also a massive triangulation among the three, to the point where neither son is really capable of bringing up challenges to the other. It’s all funneled through the father. And the father is absolutely conflict-averse and unable to manage the dynamic between his kids, because of a risk of it getting contentious with one versus the other. Although the stated reason we were hired was to help facilitate change, Bruno really brought us on with the hopes that we’d be his messengers and deliver his tough message: that his sons need to get their act together and figure out if they want to take over this business or not, because he’s not about to hand over the family business he worked his whole life to create to his kids, just to have them destroy it. That’s not our role, however; in our experience, being the messengers is the quickest way to end an engagement, because we end up getting shot. We’re working with Bruno and his sons to create an environment in which they can learn to communicate with each other effectively, validating each other and hearing each other without judgment and without defensiveness. It’s a necessary first step toward crafting a fair and workable transition.